Why do UHF antennas look so … odd? If you grew up with old-fashioned yagi-style antennas,, you know the ones with the metal bars that run parallel to each other on one big pole, you might not quite understand the look of today’s antennas. This one, the Antennas Direct C4, has kind of a space-age disco look, with its two plastic “8’s” in front of a wire mesh. It’s not the sort of antenna you would have seen around the subdivision back in the 1970s, right? Way back when, most of the “important” stations were on VHF. In most cities, network affiliates found a place on the TV’s “dial” down in the range between 2 and 13. Those low numbered channels were the place to be in the early days of TV, and the big boys stayed out of UHF as much as they could. Of course that meant that TV antennas were designed mostly for VHF reception. 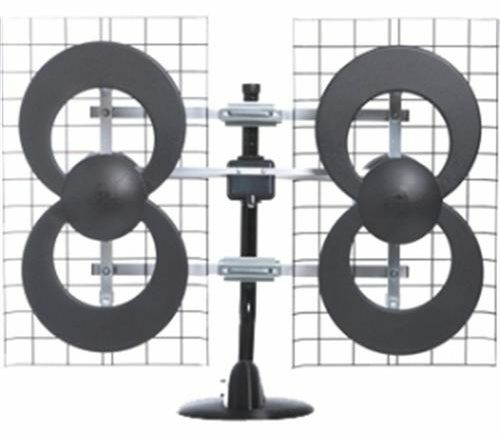 A TV antenna was a pretty big investment at one point in time and you wanted one that was going to work really well for you. Of course, many of those antennas have lasted 50 years or more so that should tell you a little bit about how they were built back then. Since TV went digital in the mid-’00s, most stations now broadcast on the UHF band. The UHF band actually does give better range which is helpful in dealing with some of the specific challenges of a digital signal, like its tendency to drop off dramatically once the signal drops to a certain point. UHF antennas don’t look like VHF antennas, and that’s why today’s smaller antennas are so… funky. It all comes down to the same idea that different pieces of metal capture different radio waves differently. Big long pieces of metal do a better job with lower frequencies like VHF, while UHF frequencies tend to perform better with smaller loops. There’s a fancy physics explanation, but hey, you probably don’t want to get into it. You were probably just asking the question to be polite anyway. The bottom line here is that in the past, you really wanted a VHF antenna with a little bit of UHF reception ability. Today, you want a UHF antenna with a little bit of VHF reception ability (in most cases.) Because you want something different, you get something that looks different. Get all the TV you need with just an antenna and some internet access!